Today I found out that the British once planned to construct a massive aircraft carrier during World War II… made of ice. Surprisingly, it wasn’t as crazy as it sounds at first glance. Britain was taking a beating from the German ships and submarines and were looking for something to build a ship out of that couldn’t be destroyed by torpedoes, or at least could take a major pounding without incurring a fatal amount of damage. With steel and aluminum in short supply, Allied scientists and engineers were encouraged to come up with alternative materials and weapons. A scientist named Geoffrey Pyke was the king of alternative ideas (as you’ll see in the Bonus Facts below). 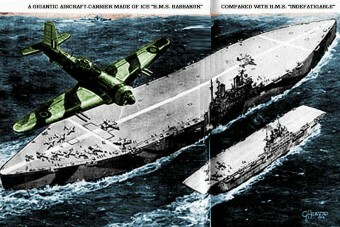 One of his ideas was to build a 2,000 foot long, 300 foot wide and two million ton carrier. Pyke named his project Habbakuk, a biblical reference that seemed to mirror the project’s goal: “…be utterly amazed, for I am going to do something in your days that you would not believe, even if you were told.” (Habakkuk 1:5, NIV) Unlike in the Bible though, the ship’s name was spelled with two b’s and one k, which is thought to be simply a spelling error that was repeated so many times that it became official. Besides the ship’s size, what was so different about Pyke’s vessel was that it would be built of ice. There is no real limit on the availability of ice; it’s easy to make, fairly durable (except in warm temperatures), buoyant, and very easy to repair when damaged. 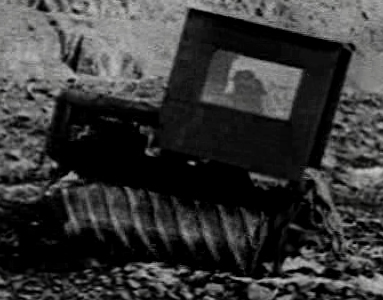 Further, repairs can be made extremely quickly with the right equipment, even during a battle. The ship was also to include 40 dual-barreled gun turrets, as well as other anti-aircraft guns, and an airstrip that could accommodate up to 150 fighter planes or twin-engined bombers. Pyke was able to sell Winston Churchill on his plan in 1942, including Churchill stating it should be given the highest priority. In testing, though, it was discovered that ice might not be as strong as the ice-bergs that Pyke modeled his idea on. It turned out that ice frozen into blocks for the hull could be broken very easily with something as small as a hammer. The project was temporarily abandoned as a result. However, later that year, a New York polytechnic firm added cellulose- sawdust, wood chips and paper shreds- to water and froze it for a much more promising base structure for such a ship. Not only was it stronger than straight frozen water- with as little as 4% of wood pulp added it made it as strong as concrete, pound for pound- it was also much slower to melt and more buoyant. Pykrete, named after Geoffrey Pyke, could also be cut like wood and easily milled into shapes like metal. There was one problem though- melting and refreezing would cause warping in the structure. Tests showed that a pykrete ship would eventually sag unless consistently cooled to around 3° Fahrenheit. To maintain this, the ship’s surface would have to be covered in insulation and it would need a refrigeration plant and duct system. To test the feasibility of getting around this problem, a small scale version of the Habakkuk was constructed in Alberta, Canada’s Lake Patricia to experiment with insulation and refrigeration possibilities and to see how it would stand up to artillery shelling. The test ship was 30 feet wide by 60 feet long, weighed 1,000 tons and was kept refrigerated with a one-horsepower engine, which was sufficient to keep it from melting even through the hot summer months. In ballistic testing, it was determined that a direct torpedo hit would only cause about a 10 foot crater in the hull, which was insignificant given the size of the proposed ship. Thus, it would be nearly impervious to torpedo attacks for all practical purposes, as it would take a huge number of torpedoes and other bombs to sink the ship. So even if the ship was broken up, the Axis powers would have had to invest a massive amount of their resources in a given area to do it (particularly considering the arsenal of aircraft the ship carried), which would have weakened them significantly on other fronts during the attack. If they were unsuccessful, the ship could be easily and quickly repaired right on the spot. So overall, the test ship made the full size version seem like it might actually work out. At this point, it was estimated that construction on the real Habakkuk would cost $2.5 million (about $32 million today), which is a bargain for a ship like this. There were still some hurdles to overcome, though. The rudder on such a ship would have to be massive. How to effectively mount this in the structure in a way that would be resistant to attack was a problem, as was controlling such a rudder. Also, the amount of wood pulp needed would have impacted paper production; while this ship used significantly less steel than most, the steel tubing it did need for reinforcing the structure would have depleted reserves for conventional, proven warships; a huge amount of cork would also be required to insulate the ship; and, finally, the ship’s top speed of just six to seven knots (6.9 to 8.1 mph) was deemed too slow, even with it being fairly torpedo-proof in terms of the main structure itself. In the end, these problems, combined with the fact that during the planning phase the range of aircraft had increased significantly to the point where the need for a floating island became less necessary, ultimately sunk the plan. While the plan to build Habakkuk was short-lived, its prototype was surprisingly resilient. It took three hot summers to completely melt the smaller version of the boat. Pyke wasn’t the first to suggest a ship made of ice. A German scientist, Dr. Gerke of Waldenberg, proposed the idea and experimented with it in Lake Zurich in 1930. And in 1940 an idea for an ice island was circulated around England’s Royal Navy but treated as a joke by officers. Beside an Ice ship, Pyke once suggested using thousands of balloons with microphones and transmitters attached as a way of triangulating enemy positions. He was not aware at the time of the advancements and development in radar technology. Yet another oddball invention Pyke came up with to help in the war was a screw-propelled snow vehicle. The vehicle would be propelled by having two cylinders with flanges in a screw thread-like fashion spinning in opposite directions and varying their speed to facilitate turns. The M29 Weasel put an end to the potential of Pyke’s snow vehicle seeing the light of day. Yet another idea of Pyke’s was to use pykrete to quickly construct buildings and protective barriers in a mobile war. In the end, this was deemed impractical given the amount of equipment, water, and pulp that would need to be lugged around. Another idea of Pyke’s, this one to solve the problem of transporting equipment from ships to shore in the many places where a harbor wasn’t available, was to create massive pipe systems from the ships that would be extended to shore and beyond as the soldiers advanced… literal supply lines. Equipment could be packed in air tight containers that would be whisked through the pipes to the waiting soldiers. Ultimately a more practical idea was developed using floating trucks and floating concrete structures. Despite only a few of his ideas having some merit to them, with most being amazingly impractical, Pyke was kept around for a time simply because the Chief of Combined Operations, Louis Mountbatten, felt that Pyke’s steady stream of outlandish ideas was good for the other members of his staff to hear, to try to get them to think a bit more out of the box. The eccentric Pyke ultimately committed suicide in 1948 by ingesting an entire bottle of sleeping pills and leaving a note to say it was intentional. One idea of Pyke’s that did pan out was his idea on how to escape from a German prison camp… the one he found himself in at the time. Most of his fellow prisoners thought he was crazy even then, as even if he was able to get out of the camp, it was felt he would either starve, be caught, or killed, before getting out of Germany itself. He proved them all wrong becoming the first to successfully escape from the camp he was in. In his fashion, he meticulously studied all accounts of escape attempts to date by others and why and where they failed. He then devised a plan, at which point he and Edward Falk, a fellow inmate, began a rigorous exercise routine to prepare for their journey. His plan went as so, with the beginning being every bit as seemingly impractical as many of his other ideas, but nonetheless working: first, use the fact that there was an athletic equipment shed that, while regularly checked by soldiers, was checked at a time of day when, if the sun was out and it was the right time of year, the sun’s rays would glare off a window and cause the soldiers looking into the darkened shed to not be able to see properly. Thus, even though he and Falk could see the guard and weren’t well hidden, the guard could not see them in the small shack. After hiding out, they then managed to slip out of the camp at night with the supply of food they’d been rationing. Following a truly harrowing journey, they made it to what they thought was the border and were caught… turns out, though, they were actually in the Netherlands when caught and were not caught by a German soldier, as they initially thought, but a Dutch one. They had made it. The work on the smaller model Habakkuk in Canada was done by conscientious objectors who did alternative service in lieu of military service. They were never told what they were building. It took eight men 14 days to build the miniature ship. Perutz, Max F. (2002). I Wish I’d Made You Angry Earlier: Essays on Science, Scientists, and Humanity. Oxford University Press. pp. 86–87. ISBN 0-19-859027-X. Collins, Paul (2002). “The Floating Island”. Cabinet Magazine (7). doi:10.1016/S0960-9822(02)00727-3. Retrieved 2008-01-12. PROBLY, ONE OF THE BEST ARTICLES EVER FEATURED BY TIFO. TNX STACI. A PLEASURE READING U. This article is more than interesting to read but I bet the ice ship would have had a lot of challenges like insulation and temperature regulation for people inside, gathering and crystallizing more ice on its path and above all, would be highly seasonal as it would only have been useful during the winter season without any method of preserving it. Hey Canadians! How about that Canadian Tire commercial w/ the ice-truck!